Moving to a new place can be a hassle, especially if you need someone to transport your car for you. Even after you hire an auto transporter there are still things you need to do. Follow the three steps to do after hiring an auto car transport company listed in this article to ensure a hassle free transport. 1. Prepare your car for the car transportation. The first thing you need to do to prepare it for transport is to wash it. The reason to wash your car before you have it moved is to help you notice any scratchers or damage of any kind so you can be sure that it is returned in the same condition. Next, clean all of your personal belongings out of the car. Your insurance does not cover the items in your car, so if they are stolen or damaged you are responsible, not the transporter. You should also disable the car alarm so it does not go off during transport. And, do not fill your gas tank completely; keep it at about ¼ so the weight is reduced. You should also have all the tires properly inflated and your battery fully charged. Fold back your wide mirrors and make sure your antennae is lowered. Finally, as you give the car to the driver you should inform them of any problems the car has, such as operational problems or leaks in the tires. 2. Next, get your car transferred to the transporter. Be sure you are on time to transfer your car to the transporter because they will not wait for you. You should go over an original inspection report with the driver prior to giving them your car. On the report there should be details such as pickup and delivery details, the exact condition of the car prior to shipping, and the cars current mileage. Once you have completed the report you need to save it! You will turn to this paper to show the company what happened if anything is wrong with your car after the transport. Put the report in a safe place so you can refer back to it later. 3. Finally, have your car transferred and receive it at your destination. While the car is being delivered you need to make sure you arrive at the destination ahead of the transporter. They are transporting more than just your car and will need to drop it off on time. Once the car is returned to you it is important you inspect it. To guarantee nothing has happened to your car during your inspection have the original report in your hand. If you notice any damage make sure you have the driver sign saying there is damage. You should avoid receiving the car at night unless you have properly lighting to inspect the car. Any complaints you have should be directed at the transport company who will handle your claim and usually quickly reimburse you for the damages. You are not finished once you have hired a car transporter. There are critical steps to follow once you selected the transporter. 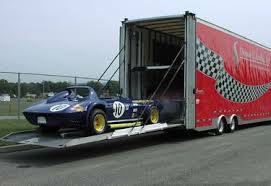 Follow three steps to do after hiring an auto car transport company and you will have a hassle free car transport!